Reach over 80,000 booksellers, publishers, public and academic librarians, wholesalers, distributors, agents, and writers in addition to more than 360,000 unique monthly website visitors with a color ad in the "most visible and trusted publication to market your products and services." For more information, scroll down to the Product Details section below. With this popular addition to our advertising co-op programs, you can advertise your book to over 80,000 booksellers, publishers, public and academic librarians, wholesalers, distributors, agents, and writers that read Publishers Weekly for a fraction of what it would cost to run a color advertisement on your own. Publishers Weekly is the most powerful publication serving all segments involved in the creation, production, marketing and sale of the written word in book, audio, video and electronic formats for over 136 years. They regularly publish highly influential announcement issues, groundbreaking news, exclusive author interviews, retails news, U.S. and international trade show reporting, and special supplements covering printing and publishing activity in international regions including Asia and Europe, PW is the most visible and trusted publication to market your products and services. PW's hefty review sections are critical to booksellers and librarians for purchasing, evaluating over 8,500 books and audiobooks in print and online annually. Marketing your book through the Co-Op Advertising Program allows you to secure premium, full-color exposure for your book in this premium consumer publication for a minimal amount of money. Your book will occupy approximately a 2" x 2.5" space along with 11 other Outskirts Press titles within a full-color, full-page ad. Your ad space will include a full-color cover image of your book, an abbreviated synopsis, the ISBN, and retail price. All books will include retail and wholesale ordering information. Due to space restrictions, the description for the book will be composed by Outskirts Press at our sole discretion based upon material and information within your Author's Center. Issues come out on a weekly basis and reservations are filled on a first-come, first served basis based upon when the order is received. Due to this policy and the lead-times necessary for print magazines, we are unable to schedule a specific week/month for the ad, or even estimate when the ad will appear. 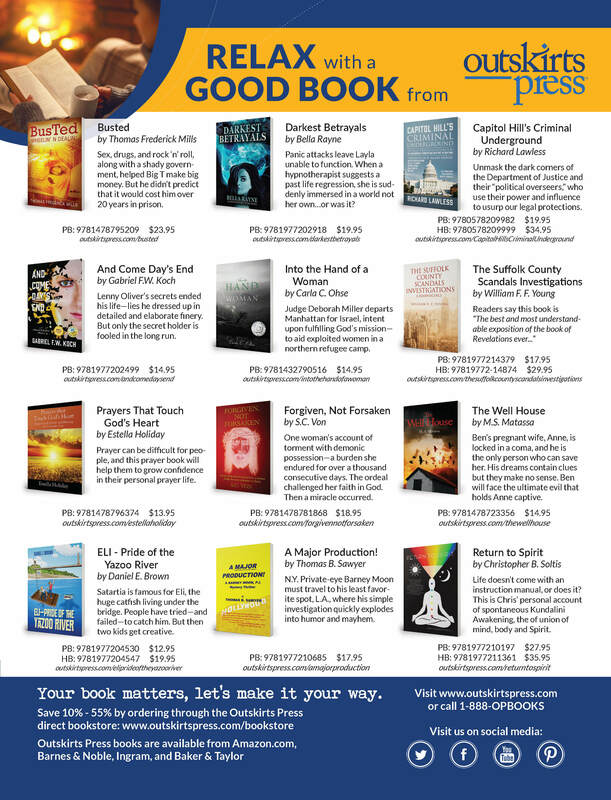 Marketing your book through the Co-Op Advertising Program allows you to secure premium, full-color exposure for your book in this premium consumer publication for a minimal amount of money. Just click the ADD TO CART button to reserve your space now. Reservations for Outskirts Press published authors are taken on a first-come first-served basis based upon receipt of payment. Reservations will be placed immediately so this order is non-refundable. Author will receive a copy of the ad as a PDF file emailed to them for their records. WANT TO SEE A SAMPLE? Click on the image below to enlarge.